Indulge in a luxurious suite stay at The Fullerton Hotel Singapore and enjoy 30 percent off the best available rate. 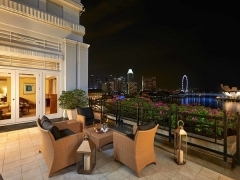 Enjoy daily Champagne breakfast, afternoon tea, evening cocktails and canapés at the exclusive Straits Club Lounge or unwind in style by the infinity pool overlooking Singapore River. Built in 1928, The Fullerton Hotel, Singapore’s 71st National Monument, is the quintessential destination hotel with panoramic views of the city skyline and Marina Bay.